The Importance Of Expert Air Conditioning Installation How often should you change your Air Filter? At one point or another in our life we are sure to experience the confusion associated with the buying the right air filter for our homes. Finding the best among several brands and sizes can be a challenging task. Also, you may wonder whether a particular brand of home air filter is worth a big investment or not. All these aspects can make it overwhelming. However, if you are assisted by experts, then making a choice will definitely get easier. You should take into consideration the size, material and MERV rating while buying air filters in Orange County. • Filter size – This is probably the easiest thing to figure because a look at the old air filter will give you an idea of the size. Refer to the label of your existing or old air filter and find out the measurements. Usually we get to see 1” thick air filters in our homes but they are available in a variety of sizes. You need to understand that air filters can be thicker in some of the systems, so just consider the same when you buy Air Filters in Orange County. • MERV Rating and Material – Every air filter is rated on a scale of 16 for its efficiency. This is known as the MERV or Minimum Efficiency Reporting Value rating. As a user, the number informs you about the efficiency of your air filter under the least efficient conditions. It informs you about the contaminant holding capacity of an air filter. There are a few things that you need to keep in mind while choosing air filters in Orange County on the basis of their MERV ratings. A higher MERV rating is always an indication of superior quality filtration but you must also understand that it costs higher to operate such HVAC (Heating, Ventilation and Air Conditioning) systems. The air filters with higher MERV ratings does not allow too much air to pass through and your system is compelled to work harder. You need to strike the right balance between air filtration, air flow and energy efficiency. You cannot just use an air filter that restricts too much air flow as that would force your HVAC system to work harder. Thus, a MERV between 6 and 8 is considered to be the standard when you are buying air filters in Orange County. 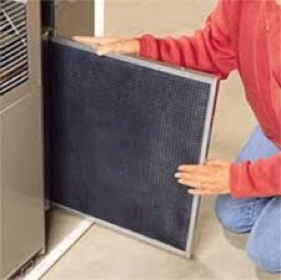 It is best to call up a service expert or HVAC technician to find out whether a particular filter is suitable for your system or not. There’s no point in giving up energy efficiency for better filter efficiency. You have to balance the elements in play and consider your needs carefully before making a decision. In case you have to deal with respiratory problems and allergies, you will have to choose higher MERV air filters in Orange County. You should always look at the bigger picture and go for an air filter that is both energy efficient and at the same time ensures better air quality at home. Filtration has undergone several changes over the past few years and there are better and more efficient air filters in Orange County. You will need to do a little research before you can find the one that suits all your needs perfectly. In case you find it difficult to arrive at a decision, hire an expert consultant to guide you during the purchase.